The weather on the mountain top has been above freezing for three days now, and the snow is slowly beginning to melt away. We're at that 'ugly' stage, where the mounds of snow along the roads are all blackened by road dirt, and the trees are still bare. Mud season is right around the corner. But the temps are in the 40's today, there's rain expected, and the birdsong is just glorious when I step out the door. Spring is surely on the way, and I couldn't be more excited to welcome it with open arms. 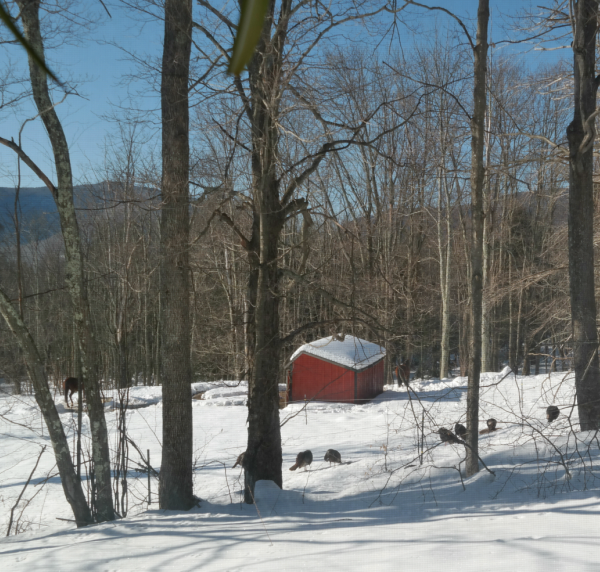 The turkeys have returned in droves - this was the view out my bedroom window two days ago. I spotted about 30 turkeys on my property that morning, the most I've ever seen! I just hope they didn't bring the coyotes back with them....it's been peaceful with both the coyotes and the bears gone. The bears are already starting to be spotted around town - I guess it's time to start putting my feeders in the garage at night once more. Always a nuisance, but better to be safe than sorry. The sunshine in the mornings has been most glorious! It's tough to leave my cozy house and head to work, when all I want to do is putter around my little house and garden and get it ready for spring. 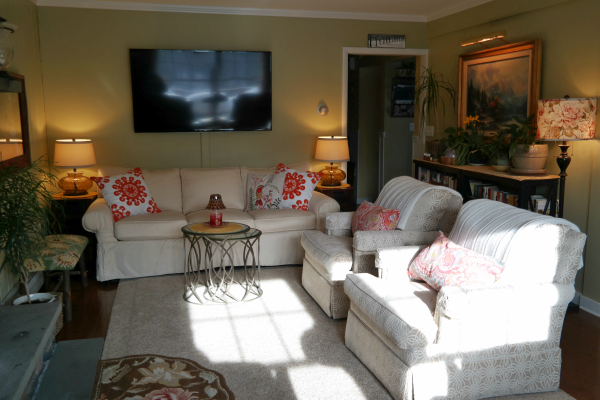 The living room got freshened up this past weekend with some brightly colored pillows in cheery spring hues. It was time to bring color back into my living room, and it makes me happy to see it! After the holidays I tend to keep things neutral, but by the end of March I'm always ready for color once more. My bedroom got a touch of spring, too, with a delicate soft pink and white quilt and fluffy pink pillow, borrowed from the guest room. 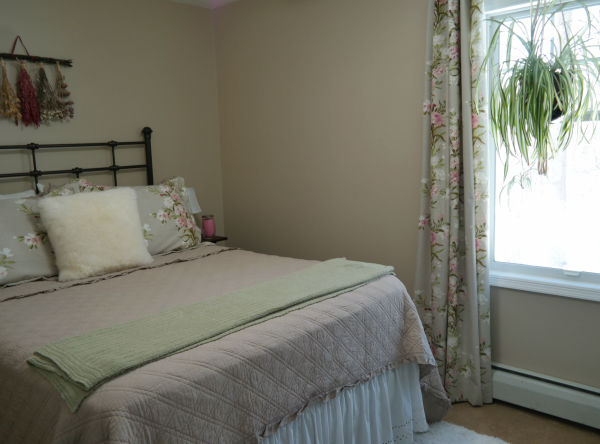 The guest room doesn't mind, it already looks ready for spring with those lovely floral drapes and shams. I'm still so sad that Country Curtains is no longer in business....sniff sniff. I'm glad, however, that I took advantage of their going out of business sales to update the drapes in my house. As you can see, I still haven't committed to any artwork for that wall....the right thing will come along some day! 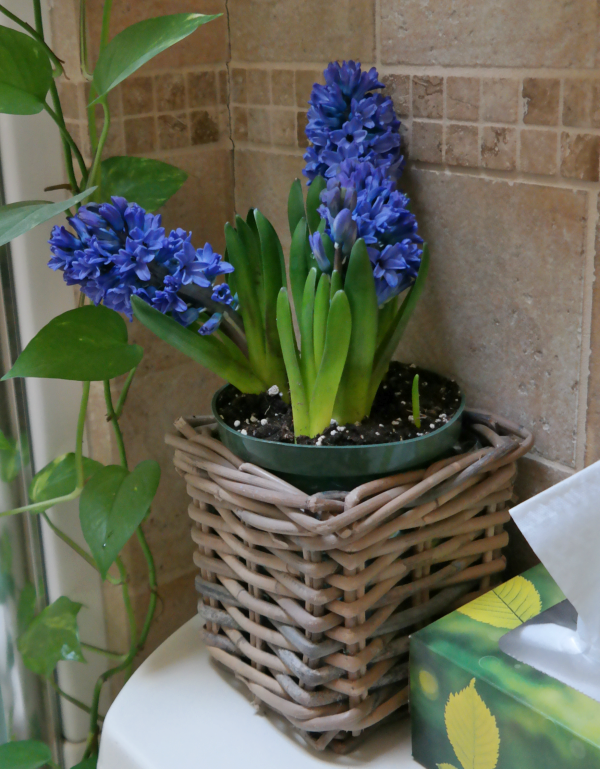 Even the guest bath got a touch of spring with these gorgeous blue Hyacinths. The aroma is absolutely heavenly, I can smell it when I just walk by the bathroom! 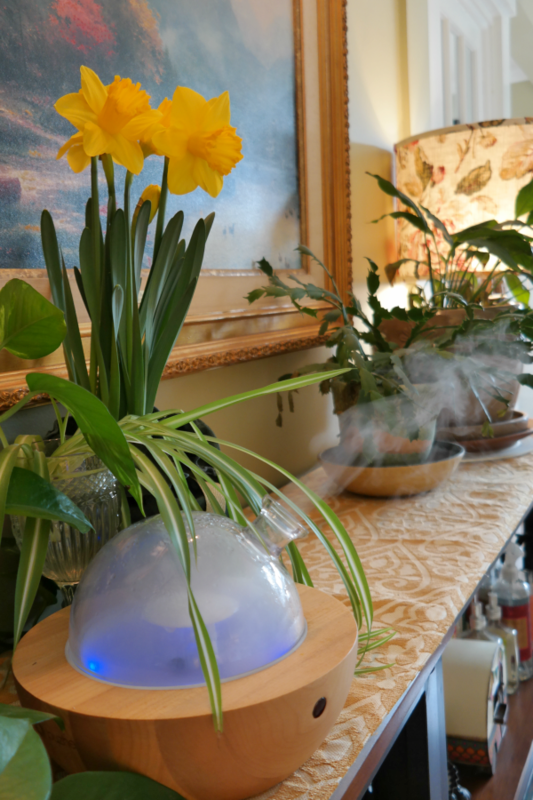 A few daffodils in the living room add a spot of sunshine next to my favorite oil diffuser. The diffuser has been going non stop when I'm at home, primarily with citrus blends for a fresh spring scent. Not only does it smell amazing in my cozy little home, but the citrus scents also give me quite the energy boost! Let's face it, who among us could not use a little energy boost every now and then? My seeds are all organized and ready to start. I must get the celery and leeks started this weekend, I'm a little late on them....oops. I have a great method of keeping my seeds organized this year. I marked the front of all the seed packets with the timeline for when they need to be started, and organized them in large envelopes to make things easy peasy. 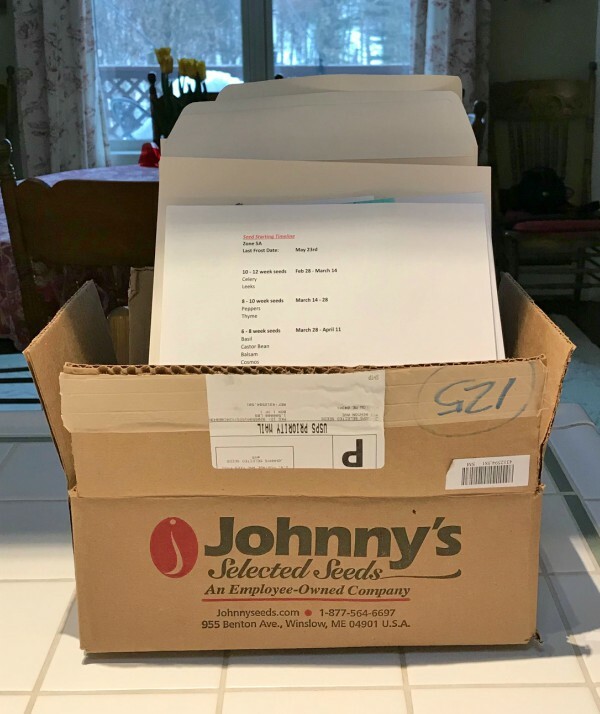 Each envelope is clearly marked (10+ weeks, 8-10 weeks, 6-8 weeks, you get the picture) and placed in the box in the order in which they must be started. In addition, I created a spreadsheet/timeline to hang on the fridge, so I know at a glance what's next. Onion and garlic starts are in the mail, as are a few last minute seeds I needed to order. The first box from Gardener's Supply has already arrived, filled with my favorite container booster mix and some energy buttons for the garden. 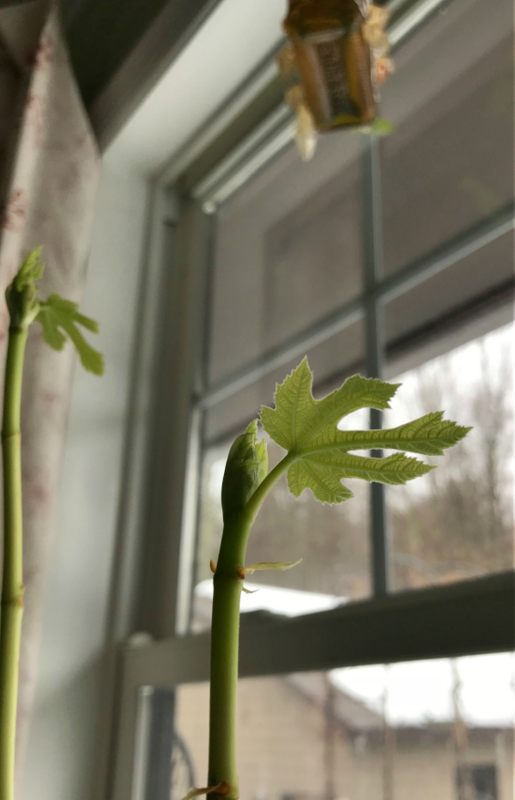 I overwintered my fig tree in the closet under the stairs, and when I went to take it out the other day it already had tons of new growth starting! The buds are turning into leaves, and it's so awesome to watch it wake up day after day. Maybe I'll even get a couple of figs this year! Figs and gorgonzola....one of the best combinations on earth. My mouth is watering just thinking of it! 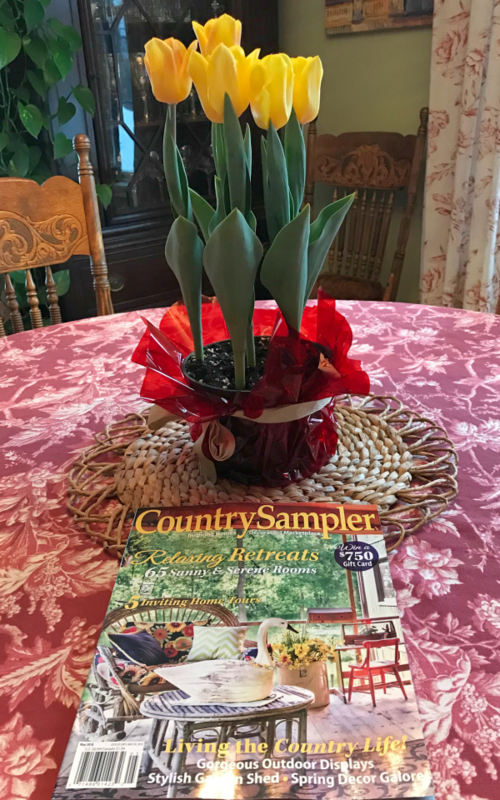 These lovely yellow tulips are keeping company with this beautiful magazine, courtesy of sweet Kris over at Junk Chic Cottage. 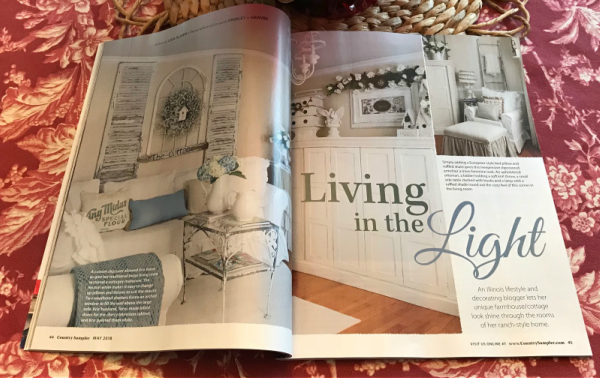 Her beautiful home was featured in the magazine, and I cannot wait for the weekend so I can sit with my coffee in my favorite chair and read this magazine from cover to cover! Meanwhile, Little Miss Molly wanted to pop in and say hi to you all. She's been with us over 6 months now, boy time does fly by, doesn't it? She has settled so nicely into her new life, and we absolutely love her to bits! Sweetie says she has brought new life to the house, and he's absolutely right. She's such a little goofball, and she makes us laugh every day! I'm sure she'll be glad when the snow melts and she can get back to her 'zoomies' in the back garden, where she puts her ears back and runs in circles as fast as her little legs will carry her! We love watching her so much, and also watching Monkey's face when she can't catch her! Spring is on the way, and life is good. Happy Easter and Happy Passover to you all!! What a great idea on how you are sorting your seeds this year. I may have to do that also. I know I am also late getting some things in and started but it is what it is. ;) I loved seeing your beautiful home, Molly and all those turkeys. Praying that you don't have problems with the bears or coyotes this year. It must be mating season for the coyotes around here because they have been very vocal and loud lately and it sounds like there are a lot of them very close by. Since I live in a small town, and on the edge of it with the farmer's fields right above me, they do indeed get close. That's so scary, Debbie, keep your little furry friends close and away from those rotten coyotes!! There was some logging happening in the woods behind my house the past few months and I'm hoping they disturbed the coyote den and they won't come back this year - fingers crossed!! Oh my, it has been so long since I did any serious gardening, but I so enjoyed reading about yours! Love the way you organized your seeds. I, too, was very sad when Country Curtains closed. It had been a year or two since my last order and I was just contemplating getting a few things when, boom, they were gone! Too bad you missed their going out of business sale, Jean - they had some great deals!! I got new drapes for most of my house during the sale, I'm so glad I did as I love them so much! What a difference quality drapes make to a room! Oh wow, I can't wait to see your garden again this year. It is always amazing. I don't know about amazing, Marty, but it sure does bring me a lot of joy!! Is this the coldest Spring beginning, like, ever? I almost ran a turkey over today on my way down town. Happy Easter to you too! Cold, snowy....winter just doesn't want to let go this year! I usually have pots of pansies out by early April but I don't see that happening this year, that's for sure!! Wow, you are organized with the seeds! I just love your drapes from Country Curtains. I did not know they were going out of business or I might have had to get some. There was a store a couple towns over from me. 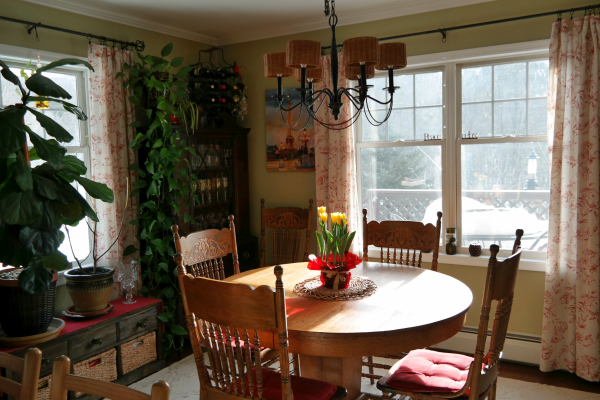 Anyways, I so love the look of the drapes on the clips hanging just on the sides of the windows that I bought a drop cloth from Lowe's and I am going to make some for my dining room. It was what I wanted when that room was first painted and then I opted for a valance. Seeing your pretty drapes has inspired me again. 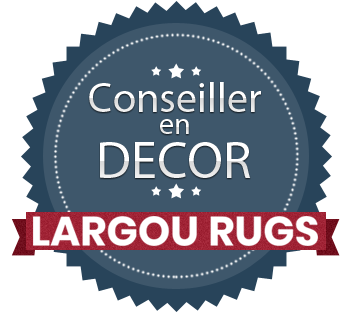 Good for you, AnnMarie - I look forward to seeing your finished drapes on your blog one of these days!! Your home is so peaceful and inviting, nestled there in the woods ! I'm a little behind schedule also but somehow it all works out in the end, Jo!! I'm anxious to see my garden again also, Susie!! It's been buried under snow for so long I forget what it looks like at all! Your home looks gorgeous in any season, Debbie. And I'm with Marty, I think amazing is the perfect word for your gardens...can't wait to see what sprouts! I wonder if some of my daffodils are sprouting under all that snow, Kim...hopefully I'll find out soon! I have such a mess to clean up once the snow clears - it did so much damage with broken branches everywhere, so many shrubs are destroyed - sad. Howdy there and I know how excited you must be for spring to arrive and to get your seeds going! I enjoyed watching last year as you got them going, growing, and then got them in the ground....and loved watching them all grow all summer as you posted pictures. Oh no! !---the bears have woke up from their slumber?--yikes! Just be careful. Little Molly is a sweetheart, time has gone by so fast, isn't it just so special and heartwarming to welcome into your life and your heart and your home....a sweet animal who NEEDS A HOME and a family? I am so in love with little miss Bindie already, her and Tammie have helped me focus on them and not on the sorrow of losing our sweet Gypsy. I will always miss her and she can't be "replaced", but it's very healing to welcome a new member into our little pack. Your home looks lovely and I do love those pretty purple hyacinths! I am so glad your sweet little Bindie is healing your heart, sweet friend - and happy Easter to you! It's so gorgeous, Ellen - I wonder if I love it even more than roses and lilacs? Hi Deb. It is always great to see your pretty mountain home. So inviting and cozy. Gosh lets hope Spring comes soon. You are so welcome for the magazine. It was fun to see my past house in this issue. Brings back lots of great memories for me. Happy Easter. I'm curious how many years ago those photos were from, Kris - I don't think I was involved in Blogland back then...looking so forward to settling in with that magazine this weekend!! I am so ready for spring! The weatherman is forecasting snow for Easter this year. Crazy! I love your spring updates. I have the same pillows you have on your couch only in yellow. Pottery Barn, right? Oh, and by the way, I just got a new puppy! Molly is a three month old yellow lab and we are in love!! Awwww, Diane, you got yourself a Molly - I'm so happy for you!!!! They bring so much love and laughter into a home!! Yes, those pillow covers are from Pottery Barn - I buy most of my pillow covers there when they are on clearance! 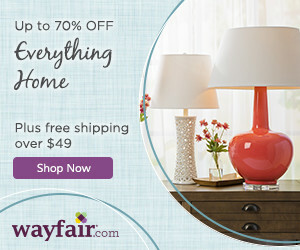 I have a few from Amazon as well...the quality isn't as good as the Pottery Barn ones, though. Happy Easter!! Your home always makes me smile. Nothing around it could ever be ugly. Little Miss Molly is adorable and so lucky to have you for her mom. I'm impressed with the seed organization. I haven't done a thing yet, except I cleaned up the patio this morning. I am so anxious to get out and clean up around my house, Brenda - it's all such a mess at the moment with broken branches, gardens that need to be cut back, birdseed all over the deck, and of course the pups leave me gifts all over also, which are revealed more and more as the snow melts! I have so much work to do but can't do a thing until this darned snow disappears....now they are predicting snow Monday night, are you kidding me? I'm done! Happy Easter, Debbie. We certainly can't complain about being damp and cold here when you're still buried under the white stuff. I've shared your horror story on the highway with several family....still can't get over that, and hope all your wounds are healed. It's damp and cold here today too, Rita - we've had rain the past two days, and apparently there's more snow coming on Monday - wahhhhh!!! I really had to find a new system for the seeds this year - since I plant so many it can be overwhelming to keep it all organized in my head - and the older my head gets the more help I need to stay on track!! Happy Easter, my friend! I am more than ready for spring here, too. We aren't buried under snow but it still is very cold here and everything is bare. You're so organized with your seeds - I'm impressed! I start sooooo many things from seed, Melanie, if I'm not organized it can get really overwhelming! I think I've settled on a system that works best, it only took me how many years? ha ha! The seeds that I've worked out the timeline for are all ones that get started in the utility room, Nancy. Anything that is direct-sow is in one envelope....and when I have ones that are staggered plantings, those packets get left out near the kitchen door. It's not a perfect system but it works! The plant on the china closet is a Pothos....it's probably the EASIEST plant to grow, I think all my Pothos plants came from one originally and I have so many of them now. That's one plant on the china closet....I have another two plants on top of the kitchen cabinets....one in the guest bath....another in the living room....one in my bedroom....two downstairs!! Crazy, right? I can mail you some pieces if you want to start one....shoot me a private email with your mailing address! Happy Easter, Nancy! Your spring color is such a treat for the eyes. We're in that mud phase right now, which means little gets done in the garden. Cold days come and go, as do warm ones! It's exciting to be in the change of seasons though, isn't it? Your sweet home looks very ready for spring to arrive. We still have tons of snow here, so I have to be contented with inside flowers. I can feel the sun getting stronger though, so it won't be long now. Happy Easter to you and your family- Molly looks so very happy. Hi Jeannette...I'm not sure I did get your comment, how bizarre - thank you, I'm so glad we are ok also - it was quite terrifying! Tons of snow here too and we got about another 4 inches this morning which I was NOT happy about! Hope you had a wonderful Easter also! Hi there! I am popping in to say hello! I have left a comment before to let you know that I am a "neighbor" of sorts...have a place in Henderson Harbor...but we only live there in the summer and early fall. I am in Canandaigua for part of the year and South Carolina for the rest! I can SO relate to your posts about living in the North Country and losing power...being without for days / weeks on end! No fun! I have a generator and there is no way I would be able to start the thing. That is my husband's department. I just do not have the strength. Your sweetie sure got you an awesome housewarming/birthday gift with that Super Duper Generator!! Good for you! Keep that man around! :) Your idea of the hyacinths is such a good one...the aroma just really brings out the SPRING in everyone! 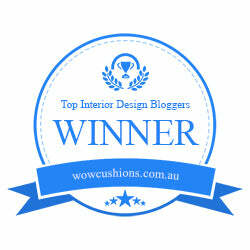 Your home is beautiful and I truly enjoy reading your blog. Just wanted to let you know that! Happy Easter to you and your family! Thank you, Jeanne, for your very sweet words!! I enjoy writing my blog, I do wish I had more time to dedicate to it but such is life. Perhaps someday! Losing power is never fun but having a generator sure makes it a lot less 'scary' that's for sure. I have well water also so one of the biggest things about losing power is when we have no water.....plus losing food out of the fridges/freezers! The generator solves that problem and it is surely a blessing, my sweetie is so generous and thoughtful! Tooth!!!! 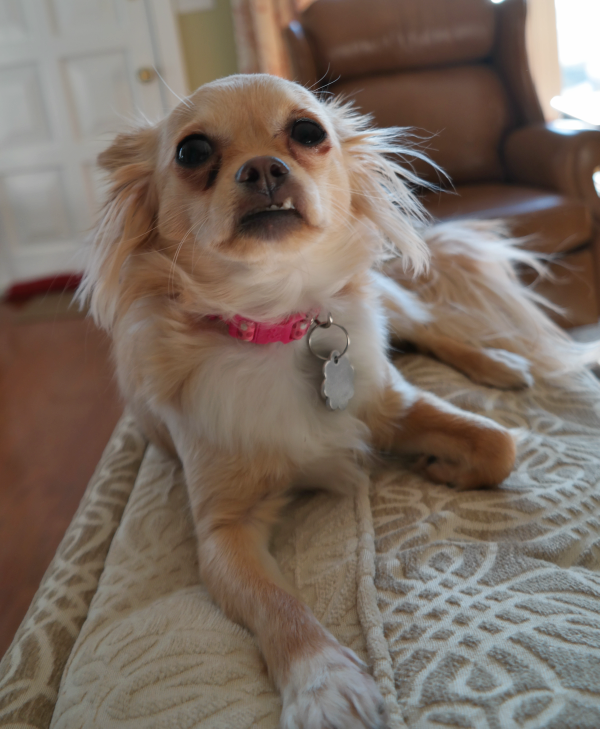 She sure does love to show off that little snaggle tooth, doesn't she??? 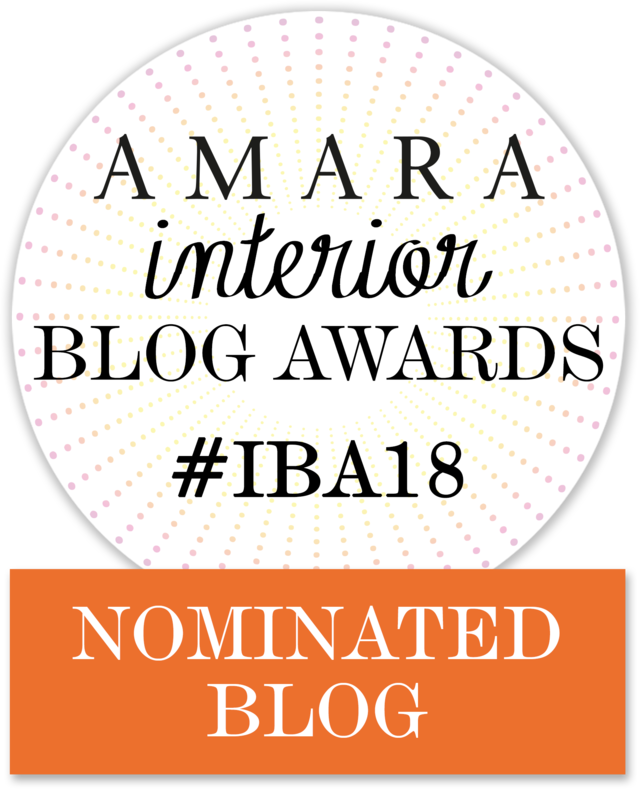 I always enjoy reading your blog posts and seeing the lovely pictures of your home. I feel so enthusiastic after I’ve read one of them. I could almost smell those hyacinths when I looked at them, and had to wonder why I haven’t bought any this year. I think I need to head to the market and get some, because I love the aroma and the freshness that they add to a room. Our Easter was met with thunder snow, sleet, and rain, if you can imagine that. So everything is rather dismal and gray here today, except for a vase of daffodils that I have on the table. I wish we lived closer because I would really like to visit you. It fascinated me to know that you overwintered a fig tree in the dark, and went to pull it out only to find it buddng! I would really like to know more about that. Also, even though I know that I couldn’t handle the big backyard that I had at my old house, I really do miss planting season. The thought of garlic, and onions, beans, leeks, the whole works, has me really wishing for a plot of ground. I’ll just have to live vicariously through you. I was also interested to read that you diffuse citrus. I have never done citrus. My diffuser is in the bedroom, and I tend to stick with Cedarwood, Rosemary, and lavender to help me sleep. Believe it or not, it seems to work. I do think I would enjoy some fresh citrus, so maybe I need a second diffuser in the kitchen area. Wonderful post! Thanks, Pattie - wouldn't that be nice, if we lived close enough to visit in person? The fig tree was a gift from a dear friend....another friend had given me a 'start' from hers and I overwintered it in the garage and it did not make it. The closet was a good choice, I keep it cooler downstairs and the closet is rarely opened so it's mostly in the dark - it worked! Perhaps you should think of some deck boxes and trellises to do some veggie gardening on your deck, Pattie? It's amazing what you can grow in a smaller space! As you remember a larger plot of land is a lot of work also....so there are pros and cons to both, for sure! I have a second diffuser in my bedroom where I also diffuse lavender and cedarwood....sometimes I use a premixed sleep blend that has valerian also but that doesn't smell as nice - they are all amazing to help me get a better sleep, that's for certain. I've gone from averaging 4 hours to 6 hours a night - which makes a HUGE difference in the way I feel and how productive I am! Love my oils! !